Making the Maven Episode 124: Are you trying to get validation through your business? Today’s guest is Lisa Carpenter! I know she’s such a fan favorite, which is why I’ve had her on the podcast each year. This is Lisa’s third time on the show and you guys just can’t get enough of her. Lisa is launching her very first book, so stay tuned to the end for more info! 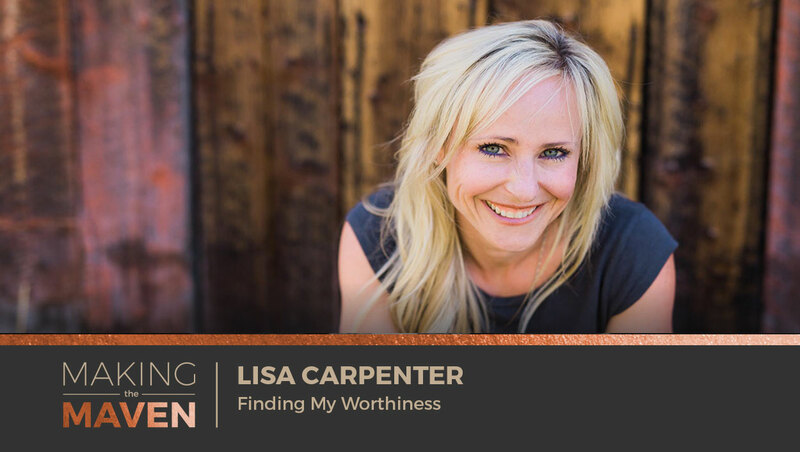 On the show, Lisa Carpenter talks about some of the struggles she had while writing her book, trying to find her worthiness in her business, and so, so much more. *Lisa has been on the show three times! She’s such a fan favorite. *Lisa Carpenter has a new book out! Please, please check it out! *Typically, Lisa tries not to work on Monday mornings or on Fridays. *Next-level leaders understand that it’s about working on themselves that’s going to get them results. *The journey, not the results, is the fun part. *Why did Lisa decide to write a book? *Lisa believes you should always ask for help. She definitely couldn’t write this book on her own and is so glad she found someone knowledgeable to help her. *Lisa already had a local following, so when she launched her online business and course, and literally heard crickets, it was discouraging. *The road to passive income is not passive. These things take time. *Lisa was constantly searching for her worthiness in her business, but she realized that her business would never fulfill that hole for her. *How do you want to feel every single day? *Lisa hated asking for help and she knew she had to challenge herself on this. *Stop hiding, stop trying to be a perfectionist, and put your work out into the world. *Have the courage to strip down your personal story, question your beliefs, and allow new information to rise above you. Challenge yourself. *We are unique and smart individuals, but we are avoiding the things that are making us uncomfortable, and this is why we struggle to grow. *Have any questions for Lisa? Feel free to reach out to her! *And don’t forget: Be kind to yourself. I want to help you turn your passion and desire to help people into a successful business! It’s such a good thing when you are providing for yourself, because you are now filled up, fulfilled and able to reach and touch even more people in your business! 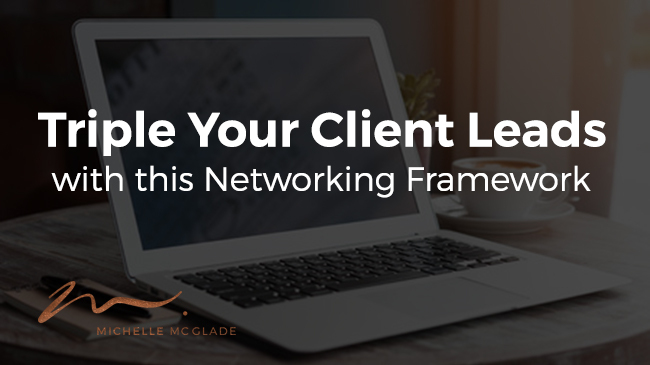 This week, I want to specifically talk about how you can Triple Your Client Leads with this Networking Framework! I want to give a bit shout out and thank you to Beth, who this question came in from. “I was wondering if anyone here uses Facebook groups to find clients?” Can you participate in a group, answer questions and invite them to talk more if they could be a potential fit for your business? Communities are a great way to build your business, but not just online communities! Between Facebook groups, LinkedIn groups and offline communities, this can be a hit for you and your business! It could be a paid community, like a BNI, Chamber of Commerce, etc., or something free. Maybe even a women’s or men’s group at your church or somewhere within your community! So for the purpose of this blog post, I’m not differentiating between either one. The framework I’m going to talk about will work for both. I’ve been there! I’ve been new and joining groups. One of the mentors I followed had great success leveraging online groups to generate client leads! Therefore, she really encouraged me to do the same thing, and I gave it 110% of my energy. Maybe to a fault, as at times, I’d spend hours in hanging out in these groups. I’ll be honest… I didn’t have success. I didn’t shine and didn’t leverage my strengths that helped me to produce a lot of leads. Every piece I was told to implement, I didn’t finish. Let me give you the recipe and components that you need to incorporate to make sure you’re spending your time wisely! I want this to be a success for you! You’re going to be able to generate leads and potentially Triple Your Client Leads with this Networking Framework I’m about to lay out for you! For the record, if this is something you’ve tried before and you didn’t see any success, I want you to honestly evaluate yourself against the framework below. Were you incorporating all of the aspects in the framework? If not, go back and begin to really leverage all eight components of this framework today! If you’re spending your time hanging out in places that aren’t a good fit for you, you’re wasting your time! For example, when I was first starting my holistic practice, I networked all over. Anywhere and everywhere! And many weren’t a good fit for me. Many times, I would come up with any excuse possible not to show up. You also need to pay attention to make sure that the communities you are a part of are giving you access to your target markets. If it’s not a good fit, it won’t be a good use of your time. You wouldn’t be targeting your audience. If you’re getting started, I would recommend visiting five to ten groups. Online or offline. Checkout a handful of places and than pick one or two that you can really contribute to. Don’t go wide. Go deep! That’s what makes networking and being a part of a community really successful. Make sure you understand why you’re hanging out in these specific groups. What are you looking for from it? Why are you choosing to show up there, week in and week out, and develop relationships? What’s in it for you? Clearly, client leads could simply be it, but let me tell you something. I was in a CEO group and the side benefit of being there was more than leads. I wanted to have a place to other high-level business owners who had scaled their teams. Since I was in the middle of having a lot of HR issues, hiring and firing, I wanted to see what others did and how they could advise me. I wanted resources and mentorship, and honestly, just support me through that process. So, client leads may be a side benefit. But make sure to set goals for yourself so you know specifically what you’re doing there! You can’t expect to truly participate in a community if you never show up. You’re probably not going to meet the goals you set out for yourself, or find those leads you’re looking for. Be an active member! A participating, ongoing, member! Make sure you go into it knowing it’s more of a marathon, not a spring. I see too many people expecting results very quickly and when they don’t see results in the first few weeks, they give up. That’s not the way to go about it! Be in tune with what other people are asking and be generous. Give your time to them! If they’re asking for help, help them! If they want you to share something like feedback, or to spread the word about an event they are having, give them your time and contribute back in the ways that they are asking for! You have a specialty and an expertise in a specific area. You have a skill set and strengths that are different and unique. Be aware of sharing this value. Don’t just be generous with your time, but conscious about giving your value to the table! Don’t be afraid to ask and be specific! If you’re an active member and you’re giving value and supporting others, you will receive support and help in return! So you’re part of a group. Online or offline. Many are large communities and there is no shortcut for making one-to-one connections. You can’t skip this! Businesses are built on relationships and the best way to develop a strong relationship and foundation is to connect one-to-one within your community! Take time away from the bigger group and really get to know individuals. It could be people you believe are potential clients, or it could be a business owner you admire. Maybe you are looking for some mentorship and you see this relationship as a potential partner. No matter what type of individual you’re looking for, do it one-to-one! And don’t forget… it takes time! Make sure you don’t just meet them one time, than flake. You’ve made this investment to connect, so continue the connection! Follow up, stay in touch and continue to reach out! That, my dear mavens, is how you can Triple Your Client Leads with this Networking Framework! Making the Maven Episode 123: Women dream all the time but they stop their dream right before they even try it. Gloria Mayfield Banks is ranked the Number 1 Elite National Sales Director for Mary Kay Cosmetics and annually leads her international sales team to multimillion-dollar success. She is a motivational speaker, success strategist, and sales trainer. Her interview today will blow you away! 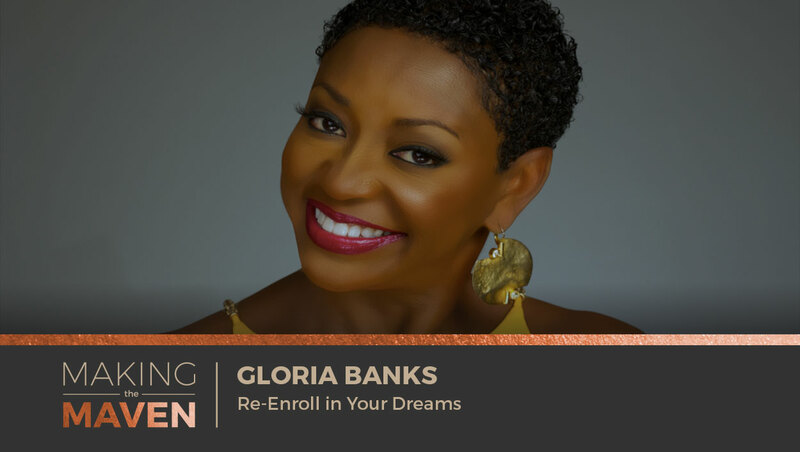 Gloria Banks is just beaming with energy and on today’s show, she discusses how you can pursue your dreams WITH the support of your friends and family and not feel so alone when doubt starts to sink in. *Gloria found out she was dyslexic in 7th grade and really struggled with reading. *How does Gloria Banks have so much energy and passion in her life? *When did Gloria decide to be unapologetic and a go-getter for her life and career, despite all the naysayers? *One of the benefits of being in network marketing is that you are surrounded by powerful, inspiring, and positive people … that believe in you! *The biggest struggle for women entrepreneurs is that they’re alone. *The angel of success is right around the corner. *It’s hard for women to convince their families why they’re going into business for themselves; because of this, they lose out on their dreams. *You can get buy-in from your family by setting tangible deadlines that they can understand. *The definition of success for most people is progress. *When you feel alone, that can turn into serious doubt and that can lead to a very cloudy vision. *Confidence needs to be reestablished as you grow. *You can’t sell somebody else your dream. Let’s talk about how you can work on making money in your business. You should have the successful business you deserve so you can reach out to more people and make the different you’re looking for! That’s the whole reason you got into this business! You want to end the suffering, spread the good word and provide holistic and alternative options to more people. But first… it starts with you building a very successful wellness business, so don’t fall into these 3 Lies You Tell Yourself that are Sabotaging Your Business. I’m specifically talking about the three lies you tell yourself about your target market. Stop surrounding yourself with myths! This is so foundational to successful marketing. 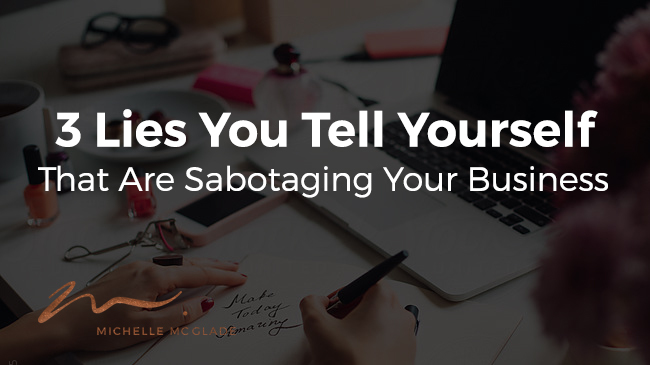 Let’s talk about these self-sabotaging behaviors that you are subscribing to that are killing your business. But most important, let’s work on turning this around by focusing on specific action steps. This is you. You’re thinking you just opened your practice, you’re just getting started and you’re not sure who you specifically want to target. I’m brand new! You’re thinking you can help everyone. You want to help a lot of different people. Well, I’ve got a lot of powerful words for that! You’re telling yourself you’ve tried it and it just doesn’t work for you. You get crickets. You’re doing “all the things”. Um, no. First and foremost, marketing IS targeted! To have successful marketing, it has to be a targeted message. When you go out into the marketplace and try to be everything to everyone, nobody will even end up hearing anything. You’re just like vanilla and people keep walking right on by. What I need you to hear is that even if you’re not sure who you want to target and you’re just getting started, it can evolve and change. But, YOU’VE GOT TO PICK SOMETHING or nobody is going to hear you. You may have already experienced this. I’ve seen it time and time again. Say you’re new. You go out and make an effort, which is fabulous. You’re out networking, you’ve put up copy on your website and you’re chugging along. But it’s all just so vanilla! It’s so much about YOU! It’s not about anybody else or what you can do for people, and as a result, nobody is responding. And now your confidence is going down. Instead, make it targeted. Make it very helpful for that target because it’s going to build your confidence. You’re going to have a much stronger message and you are going to show up with more confidence, which people will respond to! So stop telling yourself you don’t need this! Maybe you don’t even know you need this, but you do! I know it can seem limiting to just pick one lane. You’re not sure whom you want to target. You can evolve naturally over time! But you definitely need that targeted marketing message to get people’s attention. Once you get their attention, you can start talking to them a little bit more in-depth about what they’re looking for and how you can help them. Fabulous! If the phone rings and they’re not in your target market and you want to take them on, I say abso-freaking-lutely! I’m not talking about who you’re going to say yes to in your practice. I’m talking about teaching you that you have to have a targeted and focused message to be more powerful for your business. Because not being focused doesn’t produce long-lasting results. It’s a foundational step in your business! The interesting thing about this is that you feel like you’re excluding people. But, because you’re showing up in the marketplace so powerfully, clear and consistent, more people end up being attracted to you outside of that market. It’s just the way it works and you’ll have to trust me on this one! A colleague of mine has a brand that is “Leadership Girl”. She markets to women, but ends up having tons of guys come to her. It’s because she’s so effective at marketing and social media, and she can decide if she wants to say yes or no. But the key is the target! This can ultimately bleed into you saying that you’ve tried it and it doesn’t work. You’re saying, Michelle, I’m still getting crickets! I’ve had clients in your shoes. I get it. But here’s the problem: You’re not going deep enough. Let’s say you’re someone who went through a one-page worksheet on identifying your ideal client. You found it from some “guru” and was a free download. Well… you’re probably not going deep enough! Or you haven’t taken what you learned and crafted it into a powerful message that is consistent. If you’ve done some of this work and aren’t getting any responses, go back and look at the elements again! Did you go deep enough? Did you craft a message that was in their language? Not the “wellness speak”. In THEIR language. Have you been doing it consistently? It really does take some time. I’ve done this. I’ve done it poorly, just like some of you. But now I’m rocking it! It works! I had to learn the hard way and I want you to avoid my mistakes. I’ve implemented it for my own business, for my clients’ businesses and I’ve learned from the gurus. The people whoa re getting real results, seven figure results, in their businesses. So where do you start with this? Let’s talk about actionable information you can use. You need effective marketing and that begins with great targeting. Do the research! I’m doing research day-in and day-out, week after week. Understand their language and what they are struggling with. I know that can feel overwhelming, so let me give you one of two options that I want you to implement. Look at the book section and type in your topic. Look at the bestselling books in that niche and head over to the review section to read what individuals are experiencing. This can be powerful and transformative to learn their language. I will copy and paste this language into a spreadsheet, so it’s readily available moving forward. Head over to Google and type in the topic you are looking for. For instance, type in fibromyalgia, the plus sign, and the word forum to find forums related to the topic that you’re tagging. Now look for their pain points. Copy and paste this language into a spreadsheet and start looking for commonalities in there! These are the first couple steps to do to really dig into your target market. It will put you in a position to understand what they’re struggling with, as well as to craft the perfect message to reach them. A powerful message that you can use when introducing yourself locally, one-to-one, at a networking group, speaker events, etc. Use this information in the copy on your website! You will use it when you create an opt-in for your website. You’re going to use it on social media. You’ll use it to come up with topics on your blog. You’re going to basically use it every single place you go and it will be the foundation to truly creating marketing that is effective in getting results for you and your business! 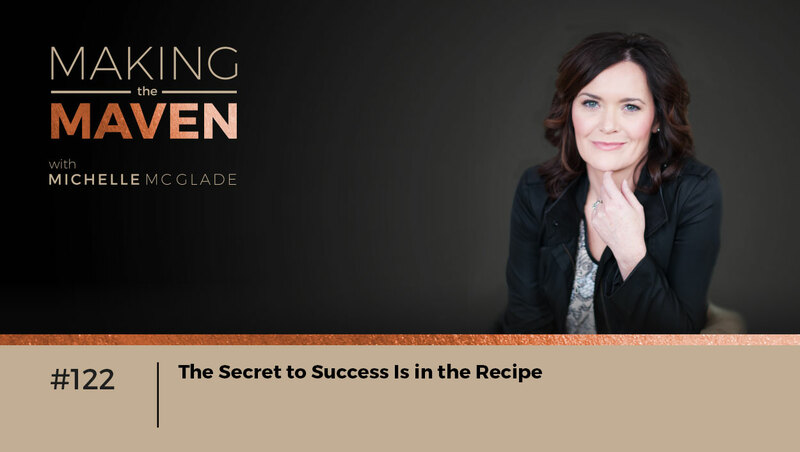 Making the Maven Episode 122: Don’t go in blind, get a recipe for your wellness business. On this week’s show, it’s just yours truly, Michelle McGlade! Hello! Over the years of running a business, there’s something that keeps coming up again and again — there’s a process to all of this. Like baking (something I love to do), you don’t just go in blind and throw in a bunch of ingredients together and hope it works. No way. You follow a recipe and the same should be true with your business. Today, I want to introduce to you and announce my Hustle & Flow Framework™. It’s a recipe for your wellness business. I’ve made a lot of mistakes over the years and there’s no reason why you should go in blind and re-create the same mistakes. This is why I’ve built a framework to help you get those dream clients the smart way! *I’ve been podcasting for the last 2.5 years! Wow. Time flies! *I try not to re-record something. I believe the first time is the real time. *The cat’s out of the bag. I, Michelle McGlade, want to announce the Hustle & Flow Framework™! *After listening to this episode, go to my Facebook page for Michelle McGlade and please, please tell me what your favorite type of cookie is! *I love, love Annmarie Gianni skin care products. *I really enjoy to bake, but I don’t like to cook. Do you have a preference? *When it comes to your business, you gotta follow a recipe! *The recipe for success is out there, the only catch is you gotta get out there and do it. *In the Hustle & Flow Framework™, I give you the recipe and help take all that guesswork out! *I learned the hard way through trial and error and there’s no reason why you gotta do the same mistakes too. *You need to hustle to grow your business, there’s no shortcut to that, but you can’t consistently hustle without burning out, which is where flow comes in! *After hundreds and hundreds of client interactions, I know what works and what doesn’t. *Everybody wants to jump directly into the flow and completely skip the hustle part. Doesn’t work that way! *I’m sorry if I sound like a Debbie Downer, but believe me, this is not hard. However, if you’re struggling, you might be following only one section of the recipe and that’s why things aren’t raising for you. *I’m sick of seeing you fail. Don’t overcomplicate it. Just make sure you’re following the full recipe!